A crosier is the pastoral staff conferred on bishops at their consecration. From around the 7th century in the Western church it was seen to be as much the insignia of pastoral office - the symbol of the Good Shepherd - as a sign of episcopal authority. This piece originally formed the upper terminal of an ecclesiastical staff. The tau-cross form was used in England, both before and after the Norman conquest. In the Old Testament (Ezekiel 9,4) the mark of the Tau is a symbol of righteousness, and thus it is particularly suitable for marking high ecclesiastical office. A French twelfth-century tau-cross head in the V&A shows, on its underside, two ecclesiastics, one holding a single volute pastoral staff (shaped like the St Nicholas crozier 218-1865) the other holding a tau-cross staff. Both of these forms existed together for some time, but around the beginning of the thirteenth century the single volute form becomes more usual. Two other tau-cross fragments, one in the British Museum and another found in excavations at Battle Abbey, very close to each other in design and execution, show foliage that is related to that on the present example, but are of less complex form and would seem to be of the early twelfth century. 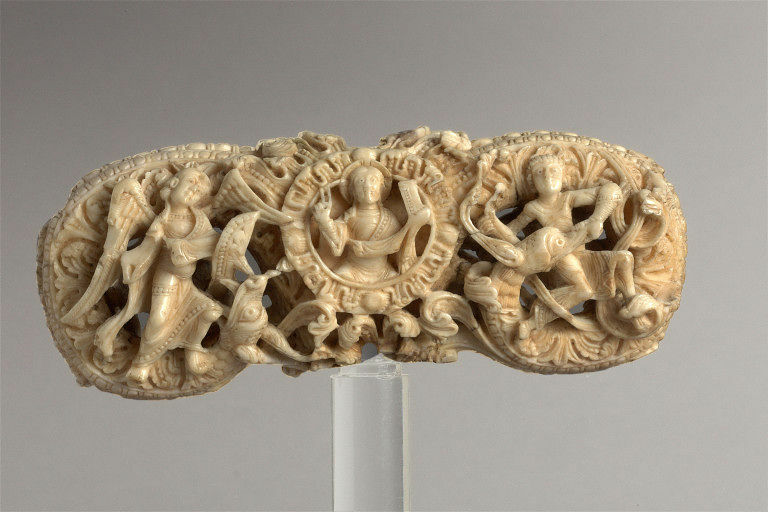 This piece represents a tour de force of walrus ivory carving. The skilful carving and intricacy of this ivory indicates, how high the standard of English carving was in the mid-twelfth century, although sadly only a small proportion of works has survived. Walrus ivory head of a Tau Cross. On one side is the half-length figure of Christ blessing, a book in his left hand and with cruciform nimbus, shown within a foliate medallion at the centre. To the left is the Archangel Michael, holding a shield in his left hand and subduing at his feet a serpent-dragon which forms part of the volute of the tau-cross. On the right a young man wrestles with a similar creature, grasping its left ear and upper jaw in a desperate attempt to avoid being bitten. On the other side the three-quarter length Virgin with the Christ-Child is shown in a foliate medallion at the centre. The Child offers the Virgin a small fruit or orb with his right hand and holds another object, probably a scroll, with his left. On either side a man struggles with a serpent-dragon in an identical pose to the right-hand figure on the other side. Said to have been in the Cathedral of Liège; collections of M. Piot and Baron de Crassier of Liege before 1715; purchased from Webb, 1871, £200. 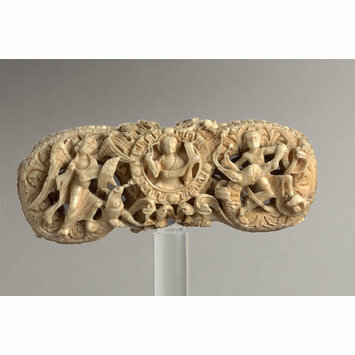 Historical significance: This piece represents a tour de force of walrus ivory carving. The skilful carving and intricacy of this ivory indicates, how high the standard of English carving was in the mid-twelfth century, although sadly only a small proportion of works has survived. The fleshy, luxuriant foliage on the cross has been compared with that found on Winchester manuscripts of the mid-12th century.